Shell Todd Oil Services (STOS) has added a number of years to the life of the offshore Maui gas field through an innovative development drilling programme that has proven new systems and techniques. Seven years since the potential for producing unrealised volumes from within the field was first suspected, STOS is now half-way through the Maui revitalisation project - with several planned wells already completed. Further extension of the 33-year-old field is now considered likely. While drilling work got into full swing in 2011, the complex task of identifying potential regions of by-passed gas in poorer, less permeable reservoirs in the field, and then designing a drilling programme to capture it, took several years. The subsurface team was required to examine a large amount of complex production data in conjunction with reservoir saturation tools and 3D and 4D modelling systems to rework their thinking about the field. That work identified extensive, field-wide baffles - impervious layers within reservoir units - and areas of by-passed gas. What was not known was whether gas could be extracted from them before water present in overlying or underlying units would break through. Given the volumes of gas involved were difficult to assess, it was vital to find the most cost-effective drilling option that would still deliver optimum results. Options on the table included employing either platform rigs or the use of coiled tubing units or hydraulic workover units (HWU) to drill new wells. The first was dismissed as too expensive, and out of the two remaining, using an HWU emerged the preferred option; it was more technically robust, cheaper, lighter and required fewer people to operate. While slim-hole horizontal sidetrack drilling is an unusual application for this type of unit, the well engineering team was able to devise and add new features to the unit that made it capable of drilling the wells it had designed. A high degree of ingenuity was demonstrated not only through the upgrade of the unit but also through its seamless integration with the existing platform's utility systems. Integration of water making, fire and gas systems meant that the HWU and platform could work as one. This maximised efficiency and cost-effectiveness, with the added benefit of streamlined health and safety operational services. Innovation was also required when designing and carrying out the wells themselves. Well re-entry, unlike typical vertical drilling, requires precision in the use of small diameter directional drilling tools, which are notoriously difficult to steer. "Geo-steering" allowed wells to be accurate in accessing the units where gas was trapped. STOS refined the drillstring and well trajectory, which enabled the wells to be accurately drilled within reservoir units only four metres thick, 3.5 kilometres below the seabed and to remain within that four-metre zone for up to 700 metres. Low-cost and easy to use absorbent down-hole seals were installed to achieve isolation between different reservoir zones. Critical for the success of the wells was having access to real-time data during drilling. Especially for this project, STOS developed and implemented a unique real-time monitoring and data flow system that was manned from its New Plymouth office, 110 kilometres away from the drill bit. The position of each well as it was drilled could be displayed directly against its prognosis on the geologist's work station. Models, updated in near real-time, fed information back to the rig about how to steer the drilling. That technology allowed quick decisions about drilling to be made and proved invaluable in ensuring the objectives of the programme were met. Further, this project was able to go from its drilling phase to production almost simultaneously. Unlike typical drilling programmes, where production is usually delayed by at least six months while the drilling rig is removed and special tubing installed, the Maui wells had a special mandrel incorporated that allowed them to produce even while the rig was still on the platform. Heavier fluid in the well could be circulated out, therein removing the high hydrostatic pressure and allowing the natural flow of gas. 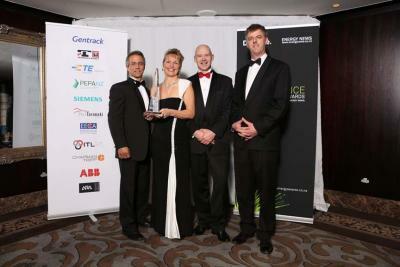 The Energy Project of the Year Award category is sponsored by ITL.